Loring & Cargasacchi Tasting Room Loring Wine Company & Cargassachi/Point Concepcion have partnered to open a tasting room located at 420 East Highway 246 between the Hitching Post II and Ostrich Land. The tasting room is open Thursday through Monday from 10:00 to 5:00, Tuesday or Wednesday by appointment only. Appointment needed for groups of six or more. 805-691-1300. Kosta Browne Winery Acquires Keefer Ranch Block Kosta Browne has purchased its first vineyard, the K2 Block at Keefer Vineyard. Kosta Browne has been sourcing Pinot Noir from Keefer Ranch since 2005 and has designated the wine since that vintage. Located in Green Valley, Keefer Ranch is 50 acres in size planted in Goldridge soil and has some of the coolest weather in the Russian River Valley. Marcy Keefer will continue to farm her remaining 30 acres. The acquisition of Keefer Ranch comes on the heels of Kosta Browne securing a long term lease of 37 acres from the Gap’s Crown Vineyard in the Sonoma Coast, and the Keefer Ranch acquisition now expands the winery’s new estate wine program. 18th Annual Grape to Glass The Grape to Glass: Back to Our Roots will celebrate the 30th anniversary of the Russian River Valley appellation and honor the founding members of the Russian River Valley Winegrowers. The event will be held August 17 and more than 50 vintners will be pouring their wine. A silent auction will be followed by a barbecue feast and a live auction of collectable wines, special dinners with winemakers, and VIP tours and vacations. A 6-foot Gravenstein apple pie will be prepared by the Vineyard Academy of Hospitality at Windsor High School, delivered by the Windsor and Rincon Valley Fire Departments, and served a la mode with Petaluma Creamery vanilla ice cream. For tickets and more information, visit www.rrvw.org. Sokol Blosser Has New Architecturally Stunning Winery This Yamhill County pioneering winery dates to 1971 and has had several “firsts.” They opened the first tasting room in Oregon in 1977 (renamed the John Storrs Tasting Room), and built the first LEED-certified winery building in the United States. The new Dundee Hills tasting room is another first, matching the most stringent environmental green standards. Several wine tasting options are being offered in a number of spaces within the new building. Visit www.sokolblosser.com. The Wine Dudes In collaboration with Eric Anderson of Grape Nutz and Grape Radio, I am writing a weekly wine blog for Orange Coast Magazine which covers a range of wine related subjects and a weekly Must-Try Wine. Here is my latest entry. Check us out at www.orangecoast.com. Family Winemaker’s The annual Family Winemaker’s tasting in San Francisco will be held on Saturday, August 17, at Fort Mason. Hundreds of family wineries share their wines with folks from the trade and consumers alike. For tickets, visit www.sfconsumer13.eventbrite.com. Video on Varietals I liked this humorous short video on varietals from Paso Robles: www.youtube.com/ watch?v=DfTaMzV4oFo&feature=youtu.be. Open Wine Bottle Without Popping the Cork Coravin’s Wine Access System 1000 is a device that replaces the traditional corkscrew worm with a thin, hollow needle. When you push the needle into the cork, it releases a small amount of argon into the bottle which pressurizes the contents and forces wine up into the needle and out of the spout, preventing air to get in. The Coravin opener costs $300 so its primary market is restaurants that don’t want to open expensive bottles when the demand is uncertain. See the video www.gizmodo.com/magical-bottle-opener-can-pour-wine-without-popping-the-967410908. Sending Pinot Noir to the Microwave A recent report from the Tasmanian Institute of Agriculture has shed new light on the potential use of microwave technology in the winery. The “controlled phenolic release” process, or CPR, uses microwaves to extract grape skins and juice at 70ºC. The longer the exposure, the more depth of color and tannin level can be achieved. The process decreases the traditional maceration process. Trials with Pinot Noir have shown that microwaved wines which are pressed off their skins before fermentation had about the same color and tannin levels as wines fermented on skins. Significantly, Pinot Noir wines that were microwaved and then fermented without skin contact resulted in wines that had high levels of aroma compounds that are responsible for cherry and chocolate aromas in wine. If the microwave exposure (maceration) occurs before fermentation, there could be less chance of producing harsh tannins. The treatment also sanitizes the must, removing background yeast and bacteria. Harmonique Opens New Tasting Room Harmonique, based in Anderson Valley and owned by Bruce and Moira Conzelman, has opened a new Tasting Room in Boonville in the former Londer Vineyards location in the John Hanes Art Gallery at 14051 Highway 128. The Tasting Room will be open Thursday through Monday from 11:00 to 5:00. Visit www.harmonique.com for more information. Amorim’s Latest Weapon for TCA Amorim, the world’s largest cork manufacturer, has developed a prototype that will allow the testing of individual corks for TCA compounds responsible for corked wine (The Drinks Business, July 25, 2013). A current gas chromatography system in use at Amorim requires 14 minutes to test each cork sample, but the new prototype can analyze one cork every 20 seconds allowing Amorim to screen up to 1.5 million of the 3.6 billion corks produced yearly. The technology would initially be used on the company’s highest quality corks. Since 2003, the Cork Quality Council has reported that its members reduced TCA by an average of 84%. Study Reveals Commercial Yeast Controls Fermentation Andy Perdue reported (Wine Business Monthly, August 2013) the results of three years of research at the University of British Columbia in Canada. The study was conducted by graduate student Jessica N. Lange working with biology professor Dan Durall. They studied yeast during several stages of fermentation of Pinot Noir and found that regardless of which yeast started the fermentation (indigenous or otherwise), a commercial strain eventually dominated the process and eliminated other forms of yeast that were present. Ken Wright, owner of Ken Wright Cellars, was fascinated by the findings and has started research in Oregon with several other wineries to replicate the graduate student’s findings. If confirmed, the idea of indigenous fermentations would be a non sequitur. 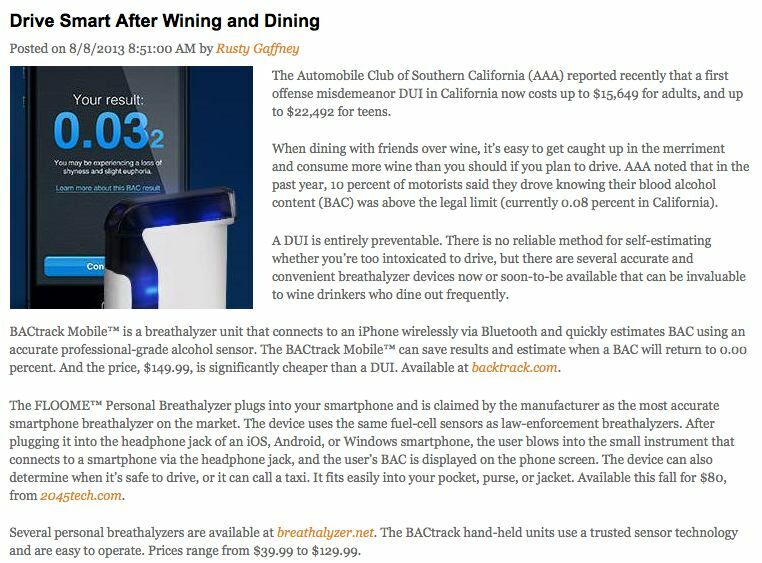 UC Davis Brett Aroma Wheel Dr. Ann Noble, a professor at University of California at Davis, and a number of colleagues, have created the Brettanomyces Aroma Impact Wheel (Wine Business Monthly, August 2013). 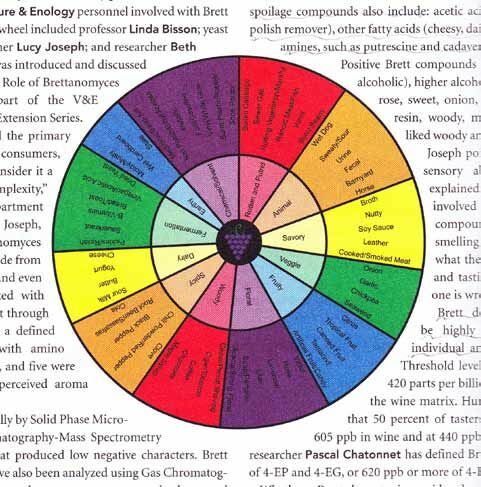 After studying Brettanomyces yeast strains and their byproducts in wine along with the results of sensory evaluations by human panels, a wheel was introduced. I found it very interesting that there was such a wide range of Brett spoilage compounds. Barnyard and horsey are often mentioned but spoilage compounds can produce aromas of vinegar, nail polish remover, cheese, dairy, sweat, and rotting meat. The researchers pointed out that Brett detection levels can be highly variable among different individuals and the wine in which it exists. Big Events for Carlton Carlton’s Walk in the Park will be held Saturday, August 17 and Sunday, August 18 at Wennerberg Park. Only $15 to enjoy both days of wine, food, art, music, nursery plants, and a classic car show. Visit www.CarltonsWalkinthePark.com. Carlton Crush Harvest Festival will be on Saturday, September 14, in downtown Carlton. Grape stomp competition, wine thief relay, barrel rolling race, wine, beer and cider garden, local artists, food, and live music and entertainment. No admission fee. Visit www.carltoncrush.com. Lenné Investment Opportunity A custom crush facility, Artisan Wine Works, will be established at Lenné Estate. Lenné’s proprietor, Steve Lutz, is offering minimum 50K investments for each unit in the facility. Each unit receives an amortized loan at 4% paid annually, five cases of wine annually which can be privately labeled, invitation to participate in two educational and food events per year, and a 25% discount on Lenné wines. Contact Steve at 503-956-2256 or steve@lenneestate.com. The West End Tasting Rooms in Dundee Located at 1326 Highway 99W in Dundee in the building housing the Inn at Red Hills and Paulée Restaurant. The West End will offer tasting of wines by Le Cadeau Vineyard, Tertulia Cellars (Walla Walla) and Evening Land Vineyards. Lompoc Wine Ghetto Relaunches Website The Lompoc Wine Ghetto in the Santa Rita Hills is growing and in an attempt to attract more visitors west of Buellton, the vintners in the Ghetto and nearby Lompoc have relaunched their website as www.lompoctrail.com. The site is very professional and easy to navigate. A printable map of Lompoc tasting rooms is available on the site. Lompoc (“Lom-poke”) has the second largest concentration of tasting rooms in Santa Barbara County. Now 19 tasting rooms call the industrial park known as the Lompoc Wine Ghetto home. Noted Pinot Noir producers located in the Ghetto include Ampelos Cellars, Arcadian Winery, Fiddlehead Cellars, Flying Goat, Longoria Wines, Samsara, Tyler Winery and Zotovich Cellars. Babcock Develops New Pinot Noir Clone According to the Santa Barbara Independent (August 8, 2013), Bryan Babcock, the veteran winemaker at Babcock Winery, has devoted the last 20 years to developing his own Pinot Noir clone or selection from a suitcase cutting that was supposedly brought into California from a DRC vineyard in Burgundy. It is named the Psi (PSI) clone, which Babcock plans to trademark and release to the viticulture market one day. Currently, Babcock offers a PSI Clone Pinot Noir. Read the PSI clone story at www.babcockwinery.com/psi-clone. 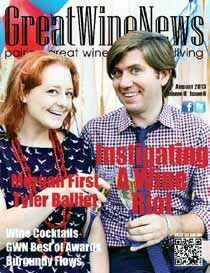 Great Wine News Check out this new, free online wine magazine and weekly newsletter. Articles are of general interest and not too technical with a light, relaxed approach to wine reporting. Beautiful photography and graphics. No reviews, just easy reading. Visit www.greatwinenews.com.